The Velominati’s Rules are a mixed bag; most of them are either very silly, really only applicable to serious carbon-fibre roadie types, or both. Some of them, however, really are universally applicable. 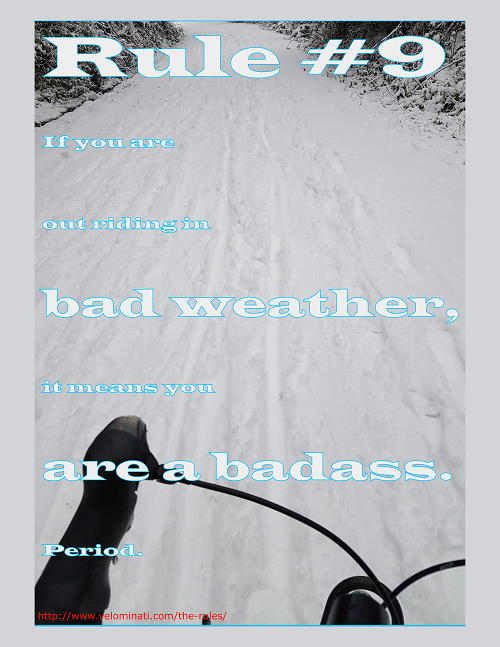 Being a year-around bike commuter I’m especially fond of Rule #9, If you are out riding in bad weather, it means you are a badass. Period. We’ve had an unusually snowy winter here in Victoria. I usually put the bike away during snow and let transit do the driving, but during our first snowfall before Christmas I was moved to try out snow-riding to get to work. It worked out OK, although my usual 15 minute commute took just over an hour in the snow! Accordingly, a poster celebrating Rule #9! Rule #9 of the Velominati. See text for PDF link! Decorate your bike parking area at work, perhaps!